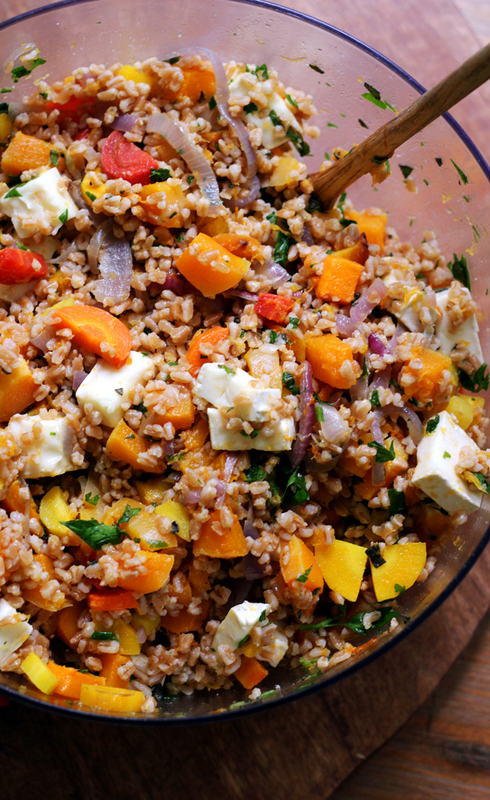 Earthy flavors and sweet roasted veggies come together in this healthy farro salad with butternut squash, red onion, and brie. If you had seen me the week leading up to the wedding, you would have been shocked and appalled that the.boy showed up to the altar at all. Knee-deep in the throes of apple butter despair, I’m pretty sure I forgot to shower for three days straight, lived in pajama pants (and not even the cute kind), and declared myself “too tired” for any sort of “physical exertion”, recreational or otherwise. Then, out of the abyss, came this farro salad. And I can truly say that it saved my life. I mean, just look at those ombre carrots and try to tell me they don’t make you feel like you can conquer the world. Mostly, though, just knowing that I had this in the fridge and could sneak spoonfuls during a random two minutes of downtime is what did it for me. Sweet roasted butternut and carrot cubes. Hang onto these for dear life and I promise you can make it through the most troubled of waters, but especially the thick cinnamon apple pre-wedding jitters kind. This recipe was actually originally characterized as a stuffing, which just baffles me. I mean, I suppose it could be shoved into the cavity of a bird but WHERE ARE THE BIG SOGGY BREAD CUBES?! And, WHY?! No, this is definitely a salad and a fairly healthy one at that. Oodles of roasted veggies, warm fall flavors, and a touch of brie that I added in for good measure and cheese endorphins and all that jazz. 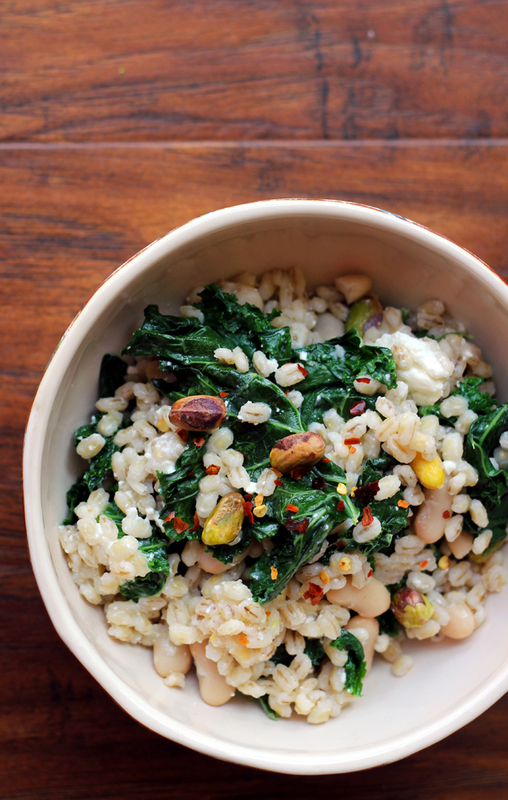 In a large pot, bring the water and farro to a boil. Add in a pinch of salt and reduce the heat to a simmer. Cook, covered, for 25 minutes, or until farro is tender. 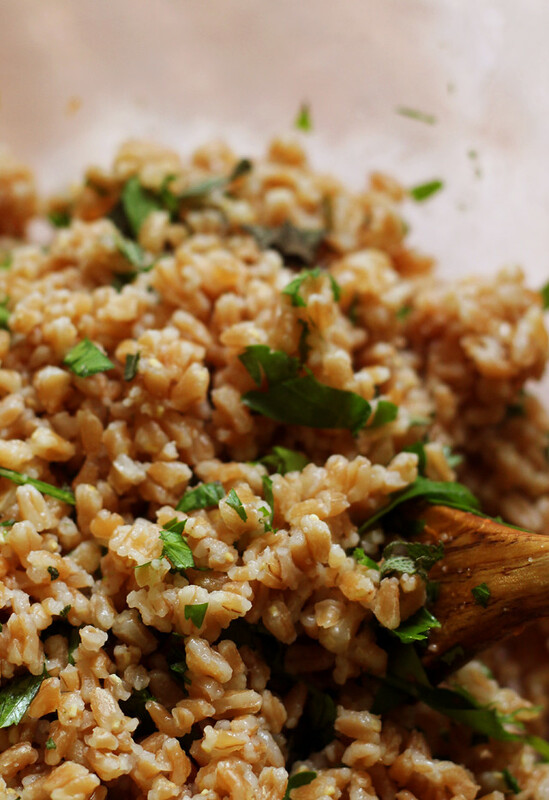 Drain any excess water and put farro in a large bowl. 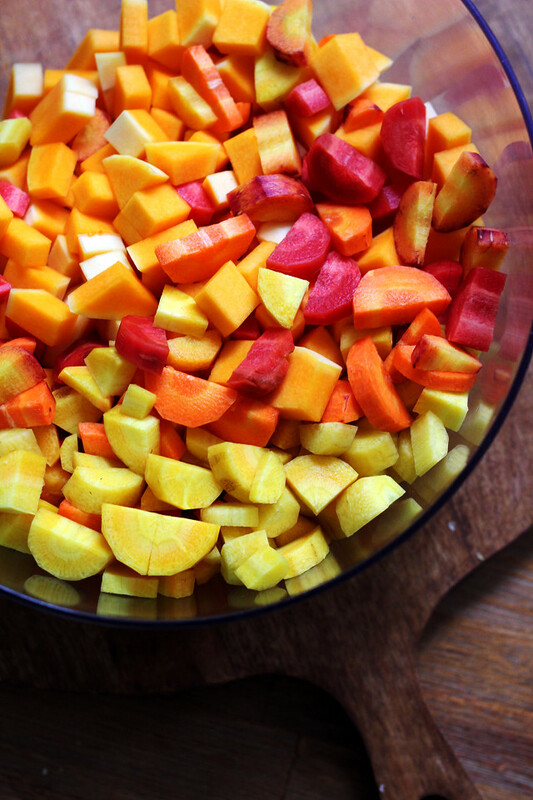 Meanwhile, in a large bowl, toss together the olive oil, butternut squash, red onion, and carrots. Season to taste with salt and black pepper. Spread out on a parchment-lined baking sheet and roast for 30-40 minutes, or until tender. 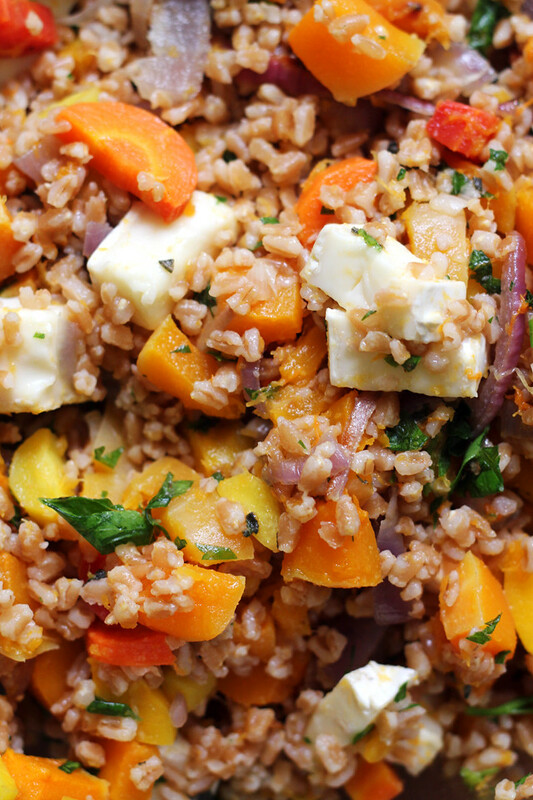 When the vegetables are cooked, toss them with the farro, parsley, sage, and brie. Season to taste with salt and black pepper. Those colours really do make me happy. 🙂 And I’ll jump off a cliff for a bite of brie. 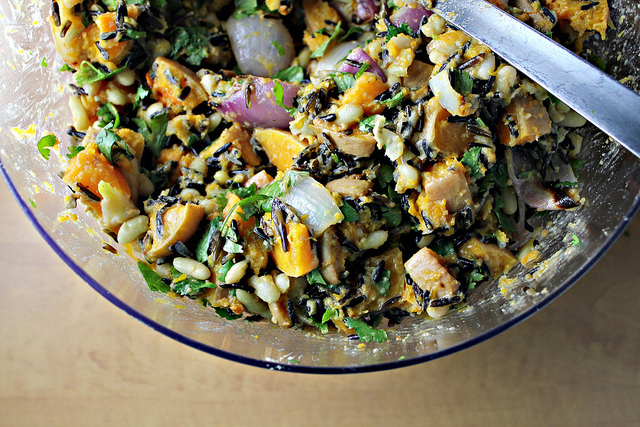 Such a great salad (stuffing??? ), such a bonus that it is healthy too. I love hearty salad bowls, so I can definitely see how this saved you! I also like how long they last…perfect for wedding week food! What a gorgeous salad! Can’t wait to try it. looks like a salad to me (definitely needs bread to be a stuffing) and I can see the sense in having this in the fridge to stop you from tipping over the edge – glad you survived the apple butter and the lead up to the wedding – now you can breathe and relax! These colors are just stunning! I need to make this ASAP. Such lovely colors and the wedding pics on instagram looked BEAUTIFUL! Congrats!! The colors, flavors and textures are all phenomenal here! Oh my heavens, love this! And the brie is such a luxurious creamy touch! Beautiful! Wow, you’ve got some amazing stuff in this salad Joanne! Pinning! I can’t wait to see some more pictures from the wedding! Looks like a life-saving dish to me! Gorgeous and De-Lish!! That shot of the carrots. . damn, that was all I needed to see. This is glorious. 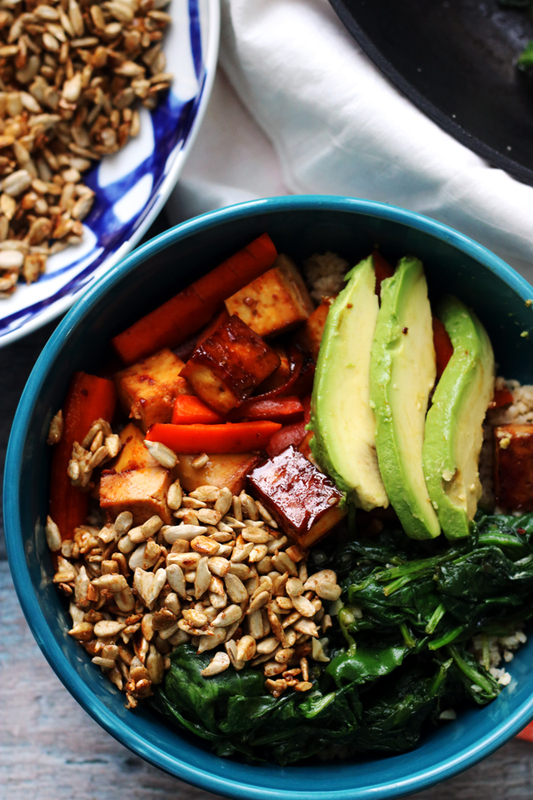 This farro salad would save anyone’s life. Damn, looks SO good!! I only make one type of stuffing: chestnut stuffing, and it has zero breadcubes (because ew). And I rarely stuff it in a bird because it is WAY too good for that. I think this was meant to be a salad. This looks amazing! DAYUM! Salad with Brie, WHAT??! Freaking LOVE it! 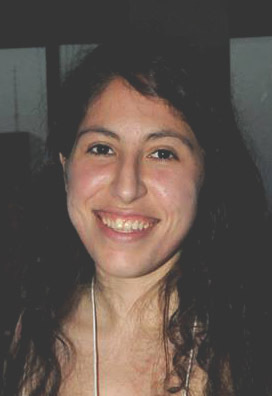 Hi Joanne, you are amazing you have not missed a beat before or after your wedding, I would of had to take at least a month off. Great dish, love faro. Congrats! Wait until you have kids. He’ll see you in a far worse state! Farro is such an unsung hero of the grain world, isn’t it. Love this. You had me at brie! 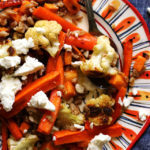 Oh man, I bet the brie gets just a little bit melty and delicious when it hits the hot roasted veggies and farro. So good! 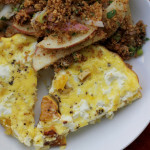 This looks wonderful and I happen to have a half wheel of brie and some farro in my fridge as I write this! No butternut, but delicata should work! Bookmarked! 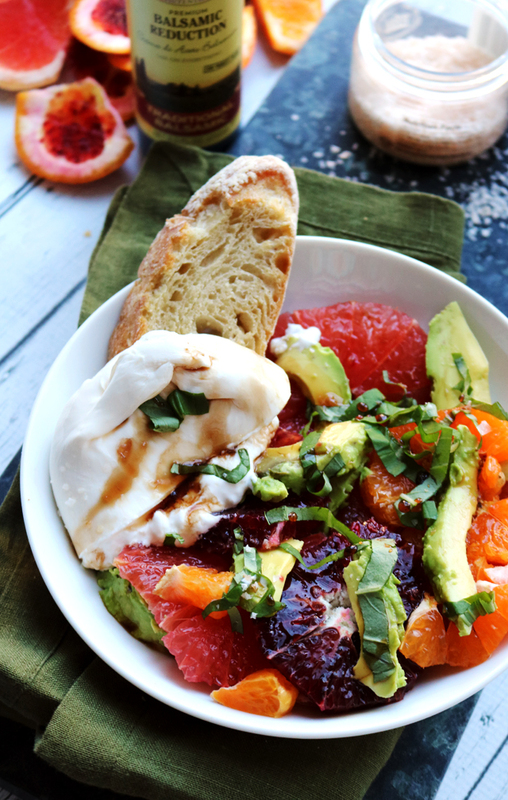 This one has me drooling… love the bits of brie in there. Oh, definitely a salad – imagine hiding all that prettiness in side a bird! Yay! Grain salads are the best. I especially love how you can make a big batch and shove it in the fridge for emergency lunch all week. 🙂 And those carrots are totally gorgeous! 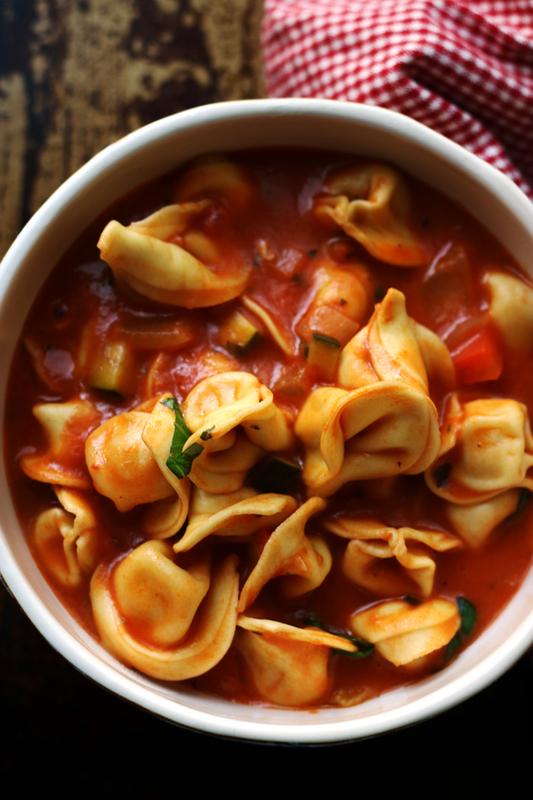 Colorful, lots of texture and hearty—wow—wonderful attributes. 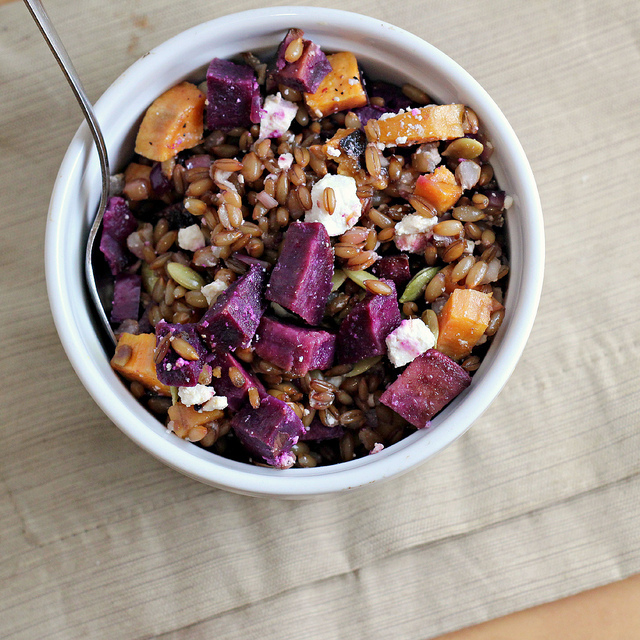 Farro has been on my “try” list in a salad form too. 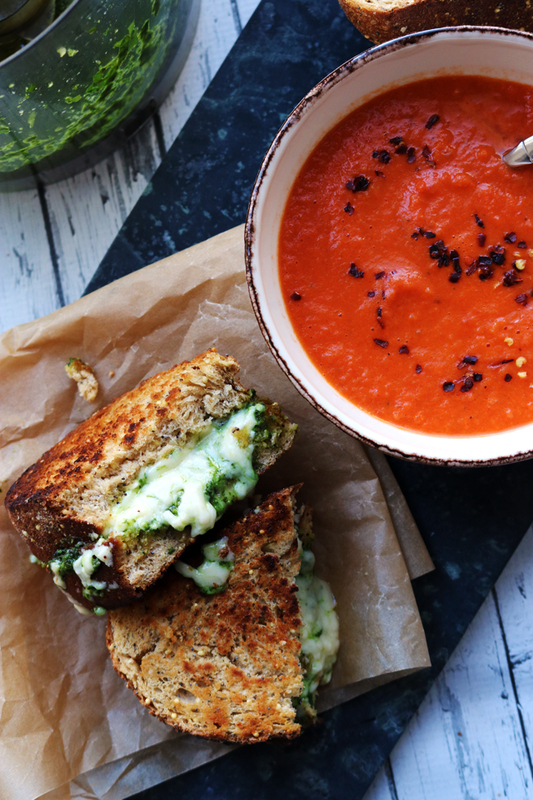 Love all the ingredients in this! The week before my wedding I drank whiskey straight (I haven’t touched alcohol in over 17 years now). I think I should’ve been eating this instead! The only thing I want to stuff this into is my mouth. 🙂 Everything is better with Brie. I love the color of this salad. I’ve never tried faro, but it has been on my try list. Great recipe to try!! I love farro too. This is a great salad, Joanne. Haha congratulations on surviving! Hopefully those ugly pajamas pants won’t need to come out again anytime soon! This salad looks amazing by the way, I can completely see how it kept you sane! It looks and sounds scrummy! Farro is fabulous! Love this dish, Joanne. (The brie pushes it over the top!) 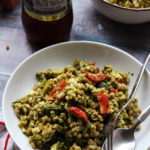 One of my fave all time dishes is farro, pine nuts and zucchini…now I have to try this one. Yum! What a delicious and beautiful salad! These are my flavors. 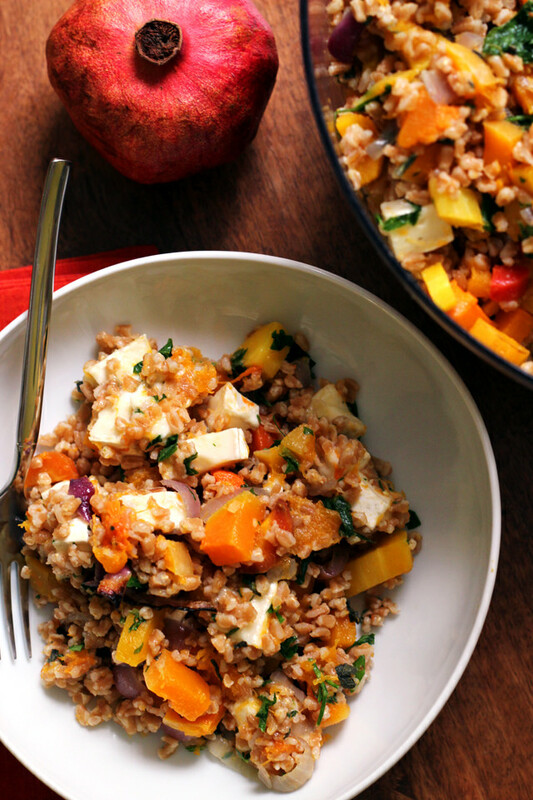 Earthy farro, creamy brie, and warm butternut squash. Yep yep yep. Pinning and totally making this this week. brie! what an unexpected and magnificent choice! Yum! I love brie (guilty pleasures) and with butternut squash I bet it would go great! This is such a beautiful salad! 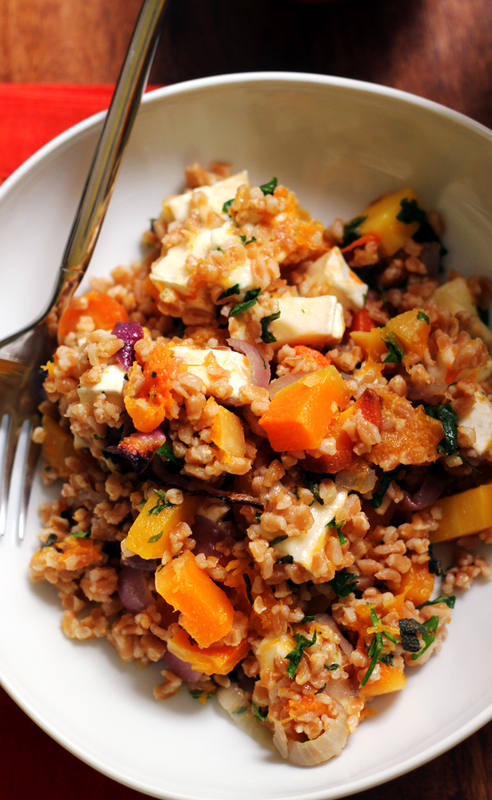 I love farro and combining it with butternut squash, carrots and sage sounds amazing! First of all: congratulations! You looked radiant at your wedding. Must have been all those carrots before the big day! 😉 This salad looks epic, Joanne! I never thought to add brie to a grain salad and now I must try it. I’m pretty sure you’ve just convinced me to make a big bowl of this to keep in the fridge to calm me when I get stressed out. It’s probably better than that pie I’ve been snacking on instead. 🙂 This looks amazing!! I made this and loved it. I only sort-of followed the directions because I had leftover farro I wanted to use, and I added cranberries to the roasting vegetables for the last 10 minutes, and I swapped the brie for feta, and I added some spinach. The cranberries and feta were great, the spinach, meh. Maybe kale next time. 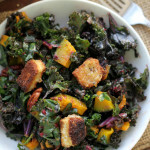 But this is a great base recipe with delicious fall flavors, and adaptable! Very fun. The parsley is the surprise genius ingredient. I won’t leave that out. I made this and loved it. I didn’t exactly follow the recipe because I had leftover farro to use, and I added cranberries to the roasting vegetables for the last 10 minutes and I swapped the brie for feta. The cranberries added a lot of flavor and color. I also added spinach but think kale would be better. The parsley is the surprise star. Don’t omit it.